An old 24V DC 1.5 A (laptop) power supply is changed to a bench power supply unit (PSU) with a cheap MingHe B3603 DC-DC buck regulator from Aliexpress. The MingHe B3603 is a constant voltage, constant current step down (or buck) power supply. with a four digit display, 3 leds and 4 push buttons. My old laptop power supply is 24 Volt, so it should work to 24-1,5 = 22,5 Volt. The connector to the laptop on the old power supply i use for providing the 24V was cut off (some years ago). On the mains side is a 3 pin power input. After providing my 220V main i measured the output and marked the + wire with red tape. The ground wire from the mains input on the old laptop power supply is direct connected to the - (ground minus) output. (It is always good to do first some measurements and testing!) I do not want one of the power output lines direct connected to the power earth. This can give strange loopbacks in your circuits. Therefore i decided not to connect the ground of the input power! As enclosure i built a wooden box open at front ant back..Some plastic from a plastic box was used to create a front panel by adding some holes. First i remove the 4 screws at corners of the PCB from the B3603 module. At the inside of the box i hot glued some screws to attach the B3603 module PCB. (I did not like additional unneeded screws on the outside.) I placed the B3603 module with some nuts on the screws. The output of the B3603 was connected to a pair of banana plug terminals on the front panel. A power switch was added to disconnect the power supply from main power . CV LED – Green - Constant Voltage mode. CC LED – Yellow - Constant Current mode. OUT LED – Red - On when supplying power. How to operate the B3603 module can be found in the manual (see link below) and on several webpages and youtube channels. An abstract can be found in the remaining of this blog article. SA .. & LO .. Save and load to storage (only if Function 1 enabled). Navigation to various setup menus and memory menus..
CV LED – Constant Voltage mode. Output voltage is at set value set, current is varying. CC LED – Constant Current mode. Current limit has been reached and voltage is varying. OUT LED – When lit, the power supply On and supplying power. When off, its output is off. If OUT LED is on, pressing the set button will turn the B3603 off. If OUT LED is off, pressing the set button will cause the display to cycle between the voltage and current set points. If the OUT LED is off, pressing the OK button will turn the power supply on. 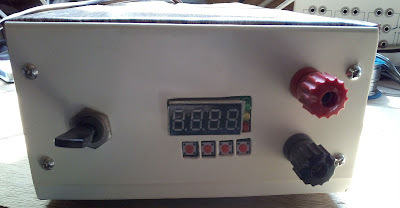 If the OUT LED is on and display is showing a fixed value, a quick press will cycle to the next value. If the OUT LED is on, pressing the OK button for more than a second will cause the display to enter a mode where it automatically cycles between the various power supply values or will cause the display to enter a mode where is displays a fixed value. A quick single press, will increase the value by one digit. Holding the button down will cause the value to increase rapidly. The set points can be changed with the power output on or off. A quick single press, will decrease the value by one digit. Holding the button down will cause the value to decrease rapidly. Set points can be decreased with the power output on or off. Read the calibration manual first! Long pressing the ‘Set Button’. gives the calibration Menu. This also outputs 30 volt (if > 30 volt applied to input, or otherwise your input voltage) that can damage an attached circuit. To calibrate you need an input power of 31-36 Volt and a load bigger than 1.2 A. Access the Functions Menu by applying power with the ‘OK Button’ pressed. With the ‘OK Button’ still pressed after power is applied the display will cycle between three values that represent the three user configurable options. The values are ‘–0-‘, ‘–1-‘, and ‘–2-‘. Function 0 – Choose whether or not the output is enabled when power is supplied to the step down converter. Function 2 – Whether or not to cycle between values as a power up option. Releasing the ‘OK Button’ on of these values will toggle the user selectable state. The module also has 10 storage locations ( 0-9) to store preset voltage/current values. Function 1 on needs to be turned on to use storage. When pressing set LO-0 or SA-0 options to load or save to storage are enabled in the menu. With ARROW UP (or DOWN) you can select a storage location and do it by pressing OK.